At the age of 19, Tom lost both his hands and both of his legs to a deadly disease. 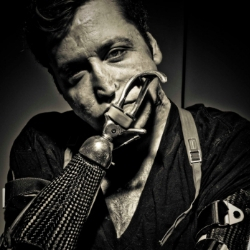 Since then he has rebuilt his life, using prosthetics to master tasks that many able-bodied individuals often take for granted. An example of the expression ‘That which does not kill us, makes us stronger’, his story inspires and amuses, while leading audiences down a path of lateral thinking, problem solving, and self-reflection. Tom’s tenacity for troubleshooting and optimism has advanced him to a journey he’d never anticipated. Applying the lateral thinking techniques previously attained in overcoming physical hurdles, Tom circumnavigates a variety of challenges and has carved out a new line of thinking, which he lives by to this day. Tom’s story of getting his life back on track one step at a time, is truly inspirational and demonstrates that that despite significant hardship, the human spirit and ‘will to live’ can prevail.